Last week, I went on holiday to Chicago to visit my godfamily to celebrate Laura (my godsister) and her graduation from high school. During our time in the suburbs of Illinois, my mom and I made a little escape one day to visit the Windy City. For our first meal, I took my mom out for lunch at GT Fish & Oyster, a handy recommendation that I gratuitously got from Alice! 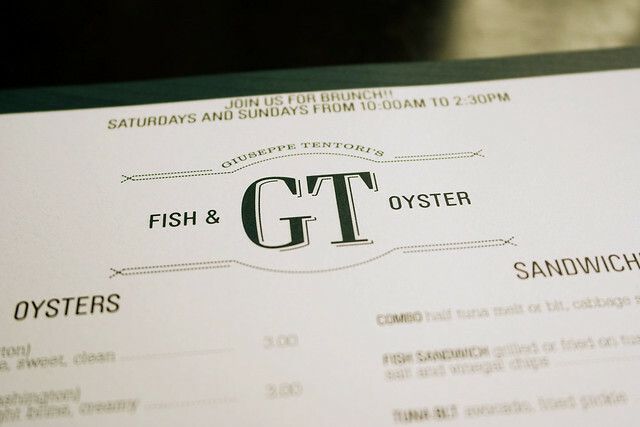 Located in the River North neighborhood of Chicago, GT Fish & Oyster is headed by Chef Giuseppe Tentori who aims "to redefine the American seafood restaurant." 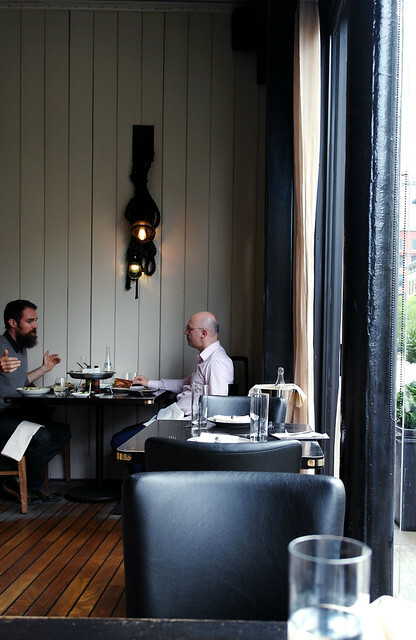 The restaurant opened in March 2011 with "a menu that is half traditional and half modern in an everchanging small plates format" which includes a rotating mix of East and West coast oysters and a wide variety of fish-centric dishes. 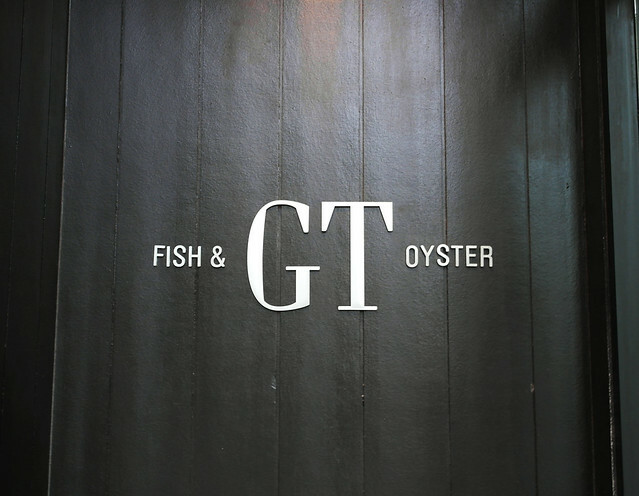 Designed by 555 International, GT Fish & Oyster's restaurant concept "draws inspiration from Chef Tenotori's distinct contrast of traditional and non-traditional items on the menu by merging new and old elements." These elements include rustic details of an old fisherman's cottage and combining them with the more sophisticated elements of a sleek yacht. The sentiment of "stepping into an elegant state room with a casual and relaxed atmosphere of the deck of the boat" is conveyed with this dichotomy. 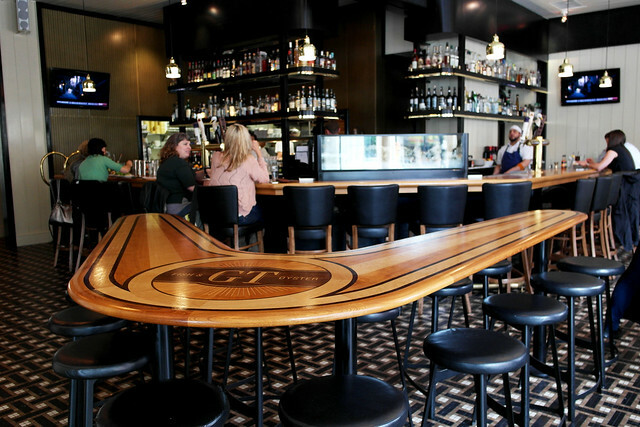 The sleek bar at GT Fish & Oyster. One of the dining areas inside. Chef Tentori grew up helping out on his grandmother's farm in a small town outside of Milan, Italy, where he later pursued and completed his culinary studies at Antica Osteria la Rampina at nineteen years old. Shortly after, he was invited to work at Chef Gabriel Viti's restaurant in Highland Park, Illinois and later at The Metropolitan in Salt Lake City, Utah. With his experience in these two restaurant, Chef Tentori returned back to Chicago and began to work at the iconic Charlie Trotter's for the next two years. 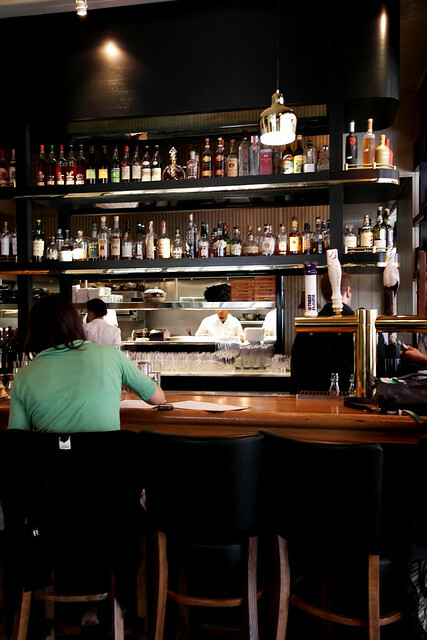 Then, in 2008, he accepted two positions at the Boka Restaurant Group -- as a partner here and also as executive chef at the eponymous restaurant. This eventually led to the newly launched restaurant concept, GT Fish & Oyster, in 2011 for which is he both the executive chef and partner. What's really great about the beverage menu at GT Fish & Oyster is that they have a lemonade menu with four unique variations on the drink as well as the option for spiking it. 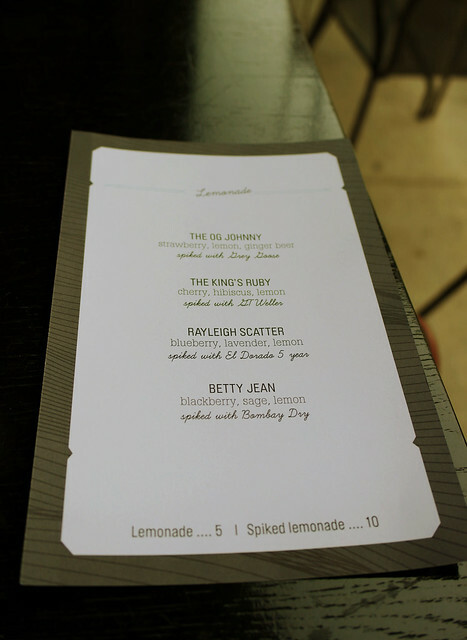 My mom had the Rayleigh Scatter with blueberry, lavender, and lemon, while I had The OG Johnny with strawberry, lemon, and ginger beer. The Rayleigh Scatter was a little less sweet but still very refreshing (perfect for my mom's not-too-sweet palate). I loved The OG Johnny as the ginger beer put a really interesting kick to the drink along with the sweet and tart strawberries. *Caraquette (East, New Brunswick): This was medium-sized and delicate with a salty and sweet finish. 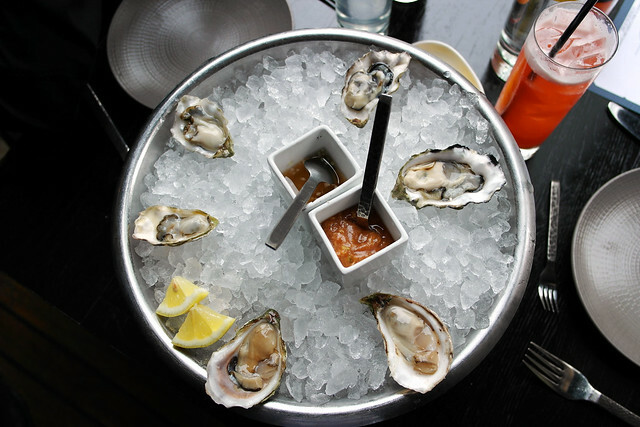 Recommended by our server, the Caraquette had the most fascinating taste -- an interesting duality of saltiness and sweetness which truly combines the best of both East and West oysters. Loved these! Sun Hollow (Hood Canal, Washington): This was medium-sized with a slight salty but clean finish. These were pretty good as well -- decent plumpness and a smooth taste. 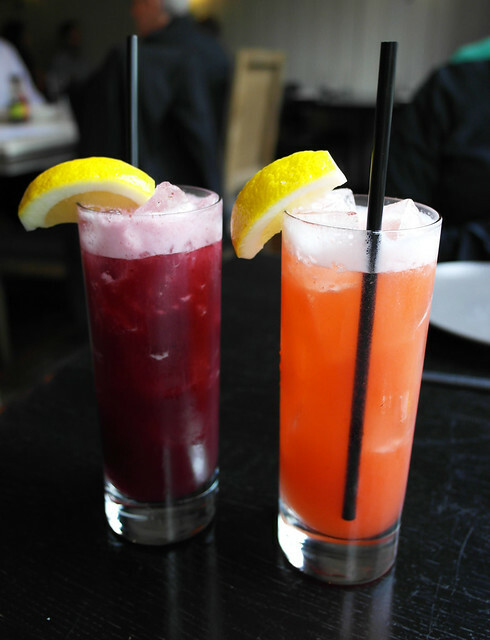 *Mirada (West, Washington): Small-sized and plump with a light brine and a sweet and clean finish. These are very similar to Kumamotos, the easy bivalve favorite, so we were sure to enjoy these. 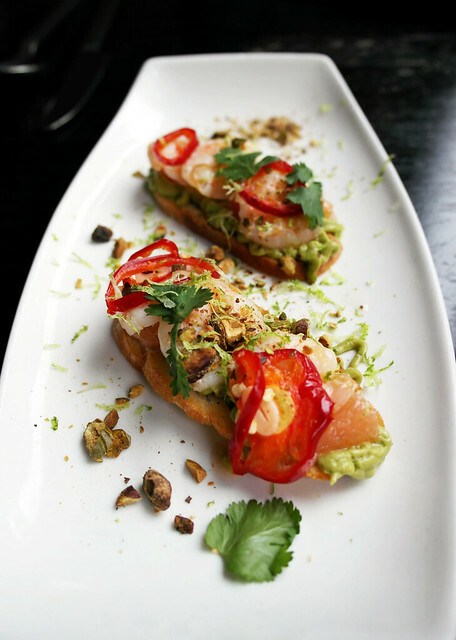 We also had the Baja shrimp bruschetta with avocado, toasted pistachio, and grapefruit. Minus a little saltiness in some bites, I absolutely loved this dish. The combination of the shrimp with the topped ingredients created a buttery, toasty, and tart medley of flavors which served really well as our initial bites of food at GT Fish. Although it was slightly oversalted, the composition of this dish was perfect. I also wanted to try the clam chowder with Neuske's bacon and housemade oyster crackers. 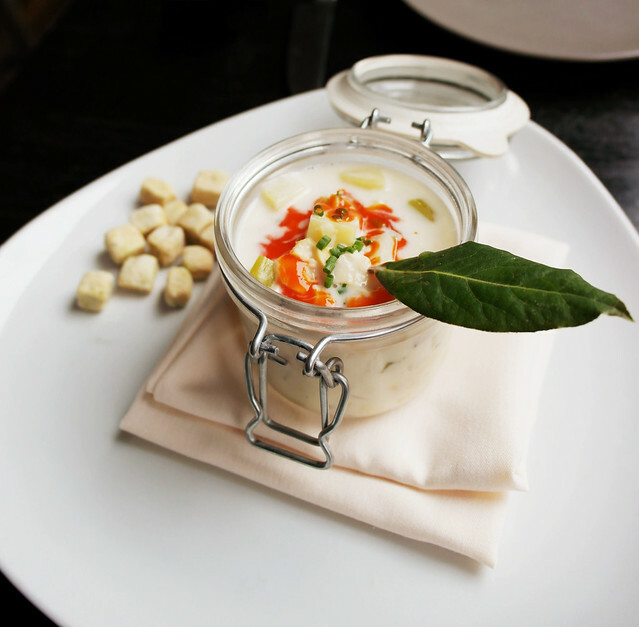 Served in a clamp-lidded jar, the clam chowder was just amazing -- it was super chunky with lots of tender potatoes, whole and chopped clams, and bits of celery. The consistency, even with the delicious chunky bits, was silky and not at all heavy with too much cream. The perfect, eight-ounce serving to sample over small-plate driven lunch. The oyster crackers were nice but on the saltier side, so the soup was still quite enjoyable without them. A smaller version of the soup also is available with a half sandwich special, so this soup is really worth trying!! 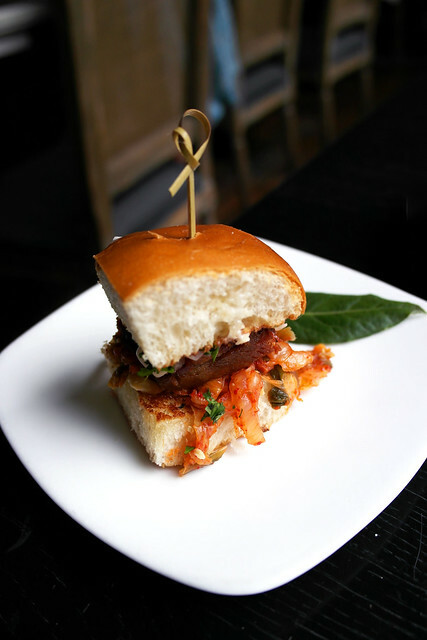 My mom and I shared a pork belly slider with kimchi and peanuts. It was the ideal size just to get a taste of it. The kimchi was well seasoned, and the pork was pretty good. While this dish didn't stand out like the others did (and wasn't one of my favorites), it's a tiny but fun deviation from the seafood-driven dishes if you're looking for that. For our last plate, we tried the Prince Edward Island mussels with roasted tomato, basil, and ciabatta. This was a major showstopper, especially as it was the "largest" small plate we had to share and thus more filling. It was great to see a mussels dish that was not the usual French-inspired, white-wine-butter-and-lemon sauce. Don't get me wrong -- that combination with mussels is obviously divine, consistently safe, and not at all fussy, but can also be perceived as unoriginal or uninspired in a sea of other innovative flavor compositions on a given menu. 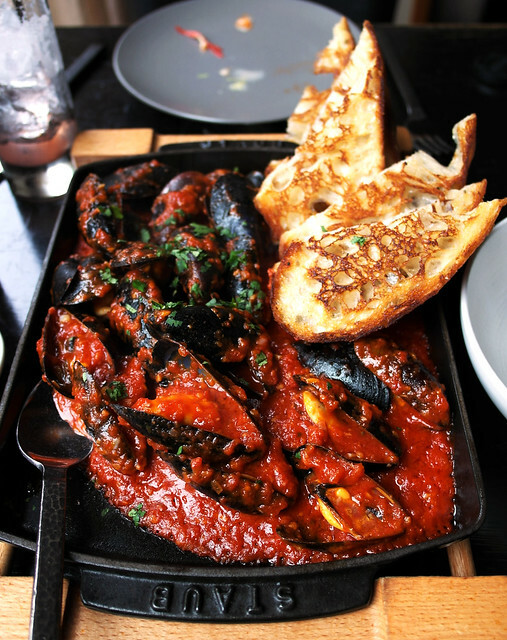 So the Italian influences from Chef Tentori's roots beamed boldy with this roasted tomato sauce for the mussels. It was zesty and dense with an intense flavor of garlic and EVOO -- the roastedness of the tomatoes really added so much more character to ths sauce, bringing out the inherent, otherwise subtle sweetness of the garden fruit. The dark, iridescent bivalves just swallowed up every bit in its pillowy, plump interior (can't go wrong with the rich variety from Prince Edward Island). Plus, the grilled ciabatta (nicely brushed with some EVOO, too) made it easy to soak up the roasted sauce, punctuating our meal oh-so-pleasantly. Findings: My mom and I had a wonderful lunch at GT Fish & Oyster. The waitstaff was incredibly helpful in guiding us through the menu (plus recommending us some kickass varieties of oysters), and the lunch portion-sizes were great for light sharing in a variety of dishes (instead of just the usual three-course deal). The quality of ingredients and composition of flavor are of high caliber in a relaxed setting, making GT Fish & Oyster ideal for occasions on both sides of the spectrum -- a casual, enjoyable meal or a business one. Plus, how can you dislike a place that has a separate lemonade beverage menu?! Yup, my point exactly. Thanks again to Alice for this awesome recommendation! Price point: $4-14 for each cold/hot plate, $5 for each lemonade, $2.75-3 for each oyster.